I recognized the face immediately when it popped up on my Facebook page, a mom smiling between her two daughters. We’ve been friends on social media for … well, since the advent of people telling journalists that social media just might be a good way to prop up the work life. Oh, say, a decade on my part. I’ve commented about special events down there in Atlanta for Michelle Hiskey, a writer of much note for the Atlanta Journal-Constitution in print and online, staffer first and then other ways. I know she’s kept an eye on me, too, from her comments about stories, and of concern around my layoff from the big daily here in Syracuse a couple of years ago. But this post was really something special. It alerted me of a story on the VOX Atlanta site about her. Hiskey has volunteered at the organization with the mission to help her city’s teens learn how to better communicate through writing for a couple of decades, and so they decided to write about her. And up top, she recalls how as a 15-year-old, she walked into the office of The Prince George’s Journal newspaper near her suburban Maryland home and met the sports editor. Seriously correct. Well, the Yoda part is her judgment call. Thank you, Michelle. 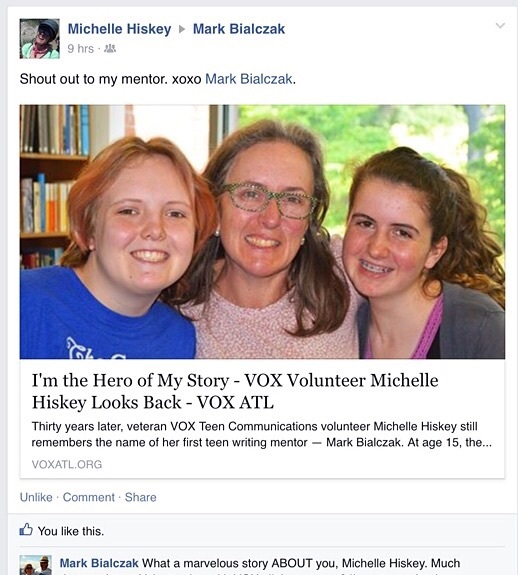 For having the smarts and confidence to come into the office that spring of 1979, for listening so well and working so hard, for giving me the honor of that mention on the VOX Atlanta site all these years later and making sure that I saw it with the Facebook tag. You were special then, and you are obviously even more special now. George VanDaniker and I, back in Maryland. That was quite the four years in my life, working at The Prince George’s Journal from May 1979 to August 1983. I interviewed for the sports editor’s job while wrapping up the final tasks at the University of Maryland in College Park and working part-time at the Washington Post. It was a twice-a-week suburban paper that my WaPo mentor, high school desk editor and part-timer honcho Michael Trilling (RIP), told me would make a fantastic first full-time landing place. I apparently nailed the session with editor-in-chief Lee Ewing, because he called me the day before graduation and asked me if I could start the day after graduation. I was the only full-timer in the sports department. Ewing had also hired as new assistant sports editor, at 20 hour per week, my fellow U of M graduate George Van Daniker. The previous editor, Jon Pessah, was leaving for the daily Washington Star, but would stay one day to lecture us in the procedures to fill the Tuesday and Friday sports sections that covered the activities of all the sports of all the high schools in Prince George’s County, as well as the teams at PG Community College and features about local athletes that went on to play at UM. The Journal’s features editor, Phil Jacobs, also was a former sports editor. That was a comforting news. Ewing and Managing Editor Don Beaupre would oversee his eager new sports managers. We’d report and write, and edit each other’s copy. I’d lay out the sections. And we’d be able to use freelance part-timers, within a budget, not a lot of money per story. Some of these writers were in place. We were welcome to hire our own. Enter Michelle, who turned out to be a star her remaining high school years, and I’m not talking about the fact that she was a really good golfer on her Northwestern High School squad. Her writing was fantastic. She took every editing change to heart. A lead is like telling a little story to your friend, I said, and she got it right away. We were so sad to see her graduate and leave to attend Duke University. Duke! Maryland’s ACC rival! No. We were proud. I remember dressing up in my shirt and tie and jacket and going to her graduation party at her house and meeting her parents and wishing her well and giving her an Associated Press stylebook wrapped in the latest edition of The PG Journal as a going-away gift. And Michelle went on to a great career at Duke, and much newspaper success. Mark Stewart came from rival High Point High School, and he would come in and write a game story in what seemed like a blur. Seriously, the words flew from the young man’s fingers. He was the fastest writer I ever saw, except for … me. His copy was clean, too. Cleaner than mine, I’ll now admit. Clunky keying on the Selectric back then. Mark Stewart and I in Syracuse. He’s the real blond kid. He graduated onto U of M, and I kept him on my radar. As assistant sports editor at The Syracuse Post-Standard, I endorsed him as a summer intern to my boss, sports editor Tom Boll. I remember how Mark impressed managing editor Mike Connor when he was the only reporter to get an interview with the winner of that summer’s Syracuse PGA Seniors Tournament because he jumped into the courtesy van and rode with the pressed-for-time champ to the airport. The last I heard, Mark was a sports reporter for the Milwaukee daily. We hired Dave Fields, a spunky young guy whose father Tom “Colonel” Fields ran the Maryland Educational Foundation, the primary fund-raising arm for U of M athletics. Dave loved to hang out with George and I when we got done at the office and headed to the local bars, another newsroom tradition. Dave would carry a Dixie cup for which to aim the juices from his chewing tobacco. He graduated from U of M to Quantico, to follow The Colonel into the Marines. Semper Fi! A year or so into our regime, the afternoon delivery Washington Star folded. We did not see this as a warning sign of things to come for our industry but an opportunity for ourselves. Jon Pessah went on to Newsday, my Long Island favorite daily. The PG Journal grew to Monday-through-Friday, as part of The Journal Newspapers chain that surrounded D.C., to step into that void. George was elevated to full-time, and we combed resumes and hired two full-time reporters. One of our hires was Jack Carey, a great friend who went on to become a notable sports writer for USA Today. Another was Emilio Garcia-Ruiz, who became first the sports editor of the Orange County Register and then of the Washington Post. 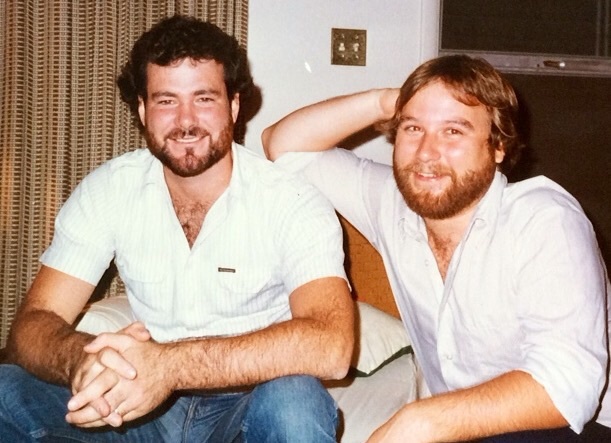 In the summer of 1983, my fellow 1979 U of M journalism grads and campus daily The Diamondback mates Tom Baden and Mark Hass gave me a call. They were rising star editors of the morning paper in Syracuse, with double the circulation of The PG Journal. They knew I was a New Yorker, and had transferred to Maryland from nearby SUNY Morrisville. They had that assistant sports editor’s position open. That’s the way the game worked. I jumped. George got my job at The PG Journal. Before I moved, I had stood up for George in his wedding to his beautiful wife Laura. After I moved, he stood up for me at my first wedding. By then I was sports editor, and he was assistant sports editor of his hometown evening Baltimore News-American. (After George left, The Journal Newspapers were sold by parent company Army Times Publishing — whose editor was Lee Ewing. The Journals ran valiantly for years, but then folded.) The Baltimore News-American folded, but George was wisely scooped up by its rival morning Baltimore Sun. But a half-decade ago, he was laid off from his assistant sports editor’s position. After a hard battle, he’s the assignment editor for a TV station in Washington, D.C. Yes, we trade emails. My wheels stopped spinning professionally, save for my switch from sports editor to music writer and critic in 1991. I loved living in the Syracuse area, the small city conveniences combined with the big city sports and arts. And, oh, how I loved that damn newspaper and all the people who had also decided to stay there who surrounded me. When and how was the last time you were taken back in memories by a social media tag? What are your favorite memories of a past job, and why? Can you draw a tree from people you worked with in the past, and if so, how high does it climb? Oh my gosh Mark, this must have been a real honor for you. I mean, there you are right in the first couple of sentences so even those too lazy to read, who just want to get the story, can see you mentioned. It must be so wonderful to see your proteges out there and doing good things and thinking about you! It was an honor, for sure, Marissa. A real pick-me-up. It’s nice to know that I had such an impact and it still means something to Michelle. What wonderful memories! You’ve touched so many lives. Thanks, Barb. It’s fun to think back every now and again and realize how special the time really was for all of us. Nice memories (except maybe for the Yoda thing! ), and a fine tribute. The Selectric image seems to apply to how we view the newspaper business before it became “digital first.” Nostalgic and bittersweet. Yeah, “digital first” meant we knew touch-method typing, compared to Neil Kerr’s hunt-and-peck, right, Jim? Bittersweet, you got that right, my friend. Um 1979 I was not yet a thing (person) so its fun reading what went on back in the day for you! My goodness Mark, you were a handsome little bugar back then! What a sweet shout out to you!! I had it going on, PJ. Oh, the ravages of time. 🙂 Thank you, my friend. I understand what you mean! Same here. Those are amazing stories Mark. The people who you met, worked with, know and how they ended up scattered through out the world of journalism, makes for really interesting reading. It’s funny but when I see someone in a position, I tend to think of it as static – with incremental changes over time. The truth of the matter is that although those incremental changes do occur, they are overlaid with quantum changes whereby people change jobs or careers or focus or cities, states and even countries and continents. In my own life, those quantum changes always catch me by surprise – although I know some people thrive on them and plan for them. Put me someplace and I burrow in and make myself at home – and unless some one or something comes along and turns my world upside down, I am happy being dug in. Anyway, it is fascinating reading about your colleagues and how you met and where they ended up. I don’t get tagged too often, but I did have an old friend tag me in a picture of us, dressed for a dance, in front of her parents’ mantle. We had a good time reminiscing for a bit. Oh wait, no, there’s one more. So long ago, I forget that I met them at work. I may need to go through and consider this! LOL No, my ball is wound too tightly for the blogosphere, but I might enjoy remembering how people have come to me 🙂 I do have posts about when I was young and had those roommates, but I don’t much post that stuff, since my life is now. Gotcha. Life is now is very good for you, Joey. Oh, Mark, this takes me back to my days as a magazine editor–when we still used a wax machine to lay it out, pica by painful pica:). Thanks for the walk down memory lane . . .
Oh, yes, Kay, when hot wax didn’t make you flinch about losing hair … Wait, sometimes it did! If we touched the cold type in the back shop, even to run a strip through the waxer, one printer would whack us on the knuckles with his pica pole, taking away a layer of skin and all that was on top of it. Ouch! Yes, indeed, Lisa. There are some good things about social media to go with the mass waves of dumb. Mark I’m not surprised that you mentored a young up-and-comer when you were so young yourself. And I’m not surprised that she recalls it and is grateful for you. 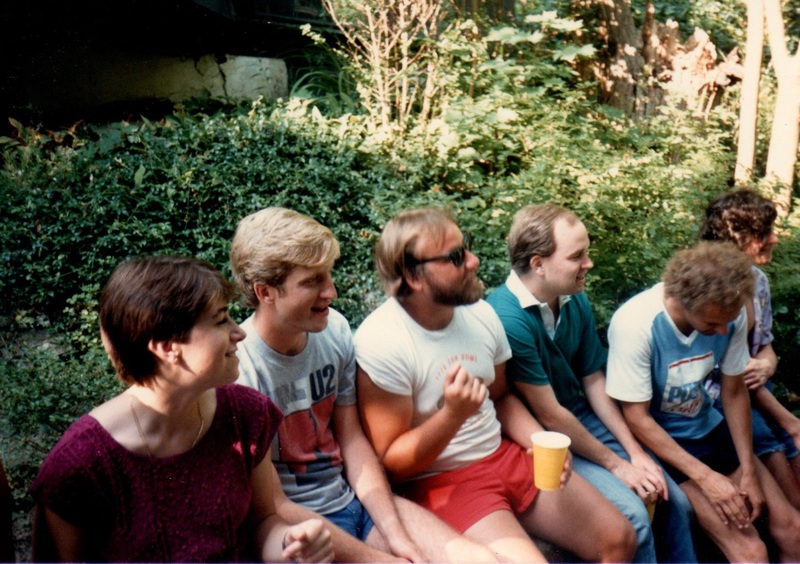 I love those old pictures of you and your co-workers, but those shorts…gotta love the 70s and 80s eh? Thanks for your kind words, Van. I feel honored, definitely. I keep up with friends from all of my past jobs on FB. I made some good friendships and don’t like to lose touch. I’m watching Federer win – Hoping for a five setter. Don’t want Andy to be beaten in three sets!! I just finished cutting the lawn and will put the tennis on now, Rachel. Go, Andy! I think he will be going – going out!! Go win Roger!! Very cool story!! It seems the world of journalism is a small, cohesive world. I can’t say that I have kept any connections, which is really a shame. Being in the military for so long, you lose touch with people and then when we became civilians and moved to California we really lost touch with everyone. Reading your story makes me wish I had put more effort into keeping the connections alive. Great post!!!! Thanks, S.D. I would think the military does a wonderful job in spreading folks out all over the world, making it harder to keep in touch. And it is such a close knit community, until you become a civilian and are flung out into the harsh real world of health insurance, paying for your own moves to new cities and being taxed on ALL your income. EEK! It’s a big world out there and once we are civilians we all seem to scatter back to our various lives. Ahhhh!!! How sweet is that!! What a nice surprise it must have been for you to be tagged. It sounds like the two of you have mutual respect and admiration for one another and that is wonderful! I love going down memory lane when sparked by someone’s social media post. It happens all the time to me on FB, particularly. 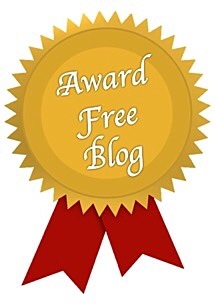 You are the bomb-diggety for coming up with the term bomb-diggety, Rachel. And for having a ton of old work buddies, too. ❤ Thank you. I can NOT believe how many posts of yours I’d missed. Ughhhhh. Pretty cool to see the pics of George Van Daniker and Mark Stewart. I worked with them at the Washington Times, plus I knew Mark when we were at the Diamondback in 1985. Mark is now a middle school teacher at a Christian school. After 19 years in the newspaper business, I went to work as an editor at the U.S. Census Bureau, and I now head up a team of editors and graphic artists. Thanks for pitching in here, Monty. It’s always nice to hear from fellow former toilers in the newspaper trenches and members of the Diamondback family. I hope you are well and enjoying your role as an editor with the U.S. Census Bureau, sir.